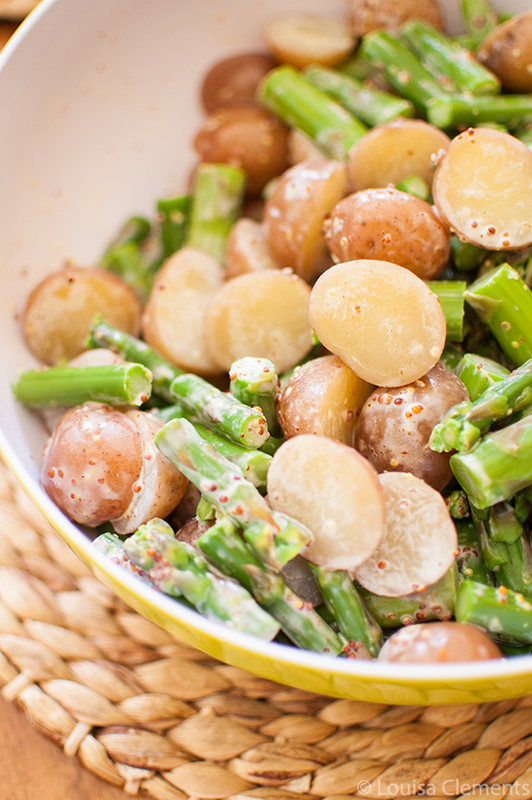 A light and healthy take on potato salad, this recipe for potato salad with asparagus is the perfect spring and summer side dish. If you follow me on Instagram (I’m @LivingLou over there) you may remember me teasing this potato salad with asparagus recipe a couple of months ago. It got such a positive response over there that it has been hard not to share it until now. But I had to hold off until the beautiful, local asparagus showed up in grocery stores. It makes such a difference to use in-season veggies! Right now is the perfect time to whip up this twist on potato salad – also known as the crowd-pleasing dish of the summer. A couple of years ago, I started to really focus on my recipes because I realized that for me, the most important thing in a food blog was high quality, creative and trustworthy content – in particular, recipes. Today, I thought it might be a little interesting to give you a bit of insight into my food blogging process. 1. I have an ongoing list of recipes ideas that I’m constantly adding to. I like to spend at least 45 minutes or so every week brainstorming new ideas. Sometimes this is just focusing on one ingredient (say, asparagus) and coming up with 10 different recipes using that vegetable. Or, I may spend 20 minutes thinking about different potato salad combinations. 2. I live by my spreadsheet; I keep track of recipes that are in-development, that are being tested and that have been photographed. I also like to keep a bank of a few finished and photographed recipes in case something happens (thanks to my Mom for this tip). 3. I plan my editorial calendar 2-3 months in advance (that means that I’m currently planning August and September, shooting photos for June and developing and testing for July). 4. For planning my editorial calendar, I reference my list of ideas, what is seasonal and trendy and then any particular cravings or recipes I’m really excited about. I also think about different campaigns or sponsorships I have going on. 5. Developing is when I actually sit down and write out the recipe and make it for the first time. Sometimes these can be major flops – I’ve had some epic failures and sometimes that can mean scrapping the idea and moving on to something else. 6. Testing is when I make the dish after I have developed it (something I do at least twice after I have developed) – I always ask for honest feedback from whoever is trying it (friends or family usually) and as a somewhat perfectionist, I’m always focusing on what can make the recipe better. Do you have any questions about my blogging process? Let me know in the comments below or shoot me an email! And just a little on this potato salad recipe, the dressing uses a touch of mayo which creates some creaminess that people love, the grainy Dijon mustard adds a nice look, but also a bit of bite and zip to the dish. I was having trouble getting this recipe just perfect and then I added a squeeze of honey which really just brings all the flavours together. Finally, the best part about this dish is that the potatoes and asparagus are cooked in the same pot; less mess = less cleanup – you’re welcome! Boil water in a large pot. Add new potatoes and cook for 7 minutes. Add asparagus, and cook for an additional 3 minutes. Drain. Meanwhile, in a large bowl, whisk ingredients for dressing. Add potatoes and asparagus to dressing and toss to coat. Serve immediately. 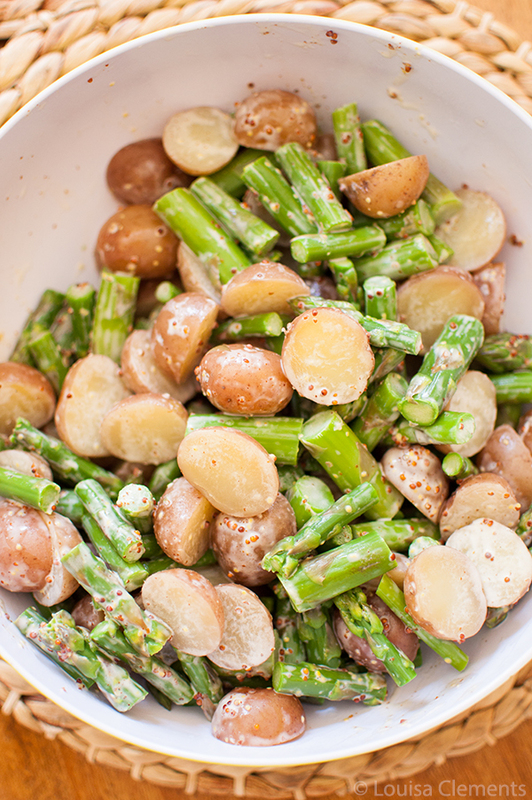 Let me know if you give this potato salad with asparagus a try in the comments below. Your recipes are always so good - now I know why! In our country we remove the outer cover of potatoes. How does it taste. I will try I guess it have some nutrition values. Hi Dorcas, yes you can peel the potatoes, however because the variety I am using in this recipe are new potatoes, you don't have to remove the skin. I would even keep the skin on for yellow potatoes also if you substitute with them. Let me know how it goes!